Just because you can't see it, doesn't mean it's not there. Chlorine was first added to your drinking water in the late 1800's. By 1904 chlorine was used in water treatment regularly and is still poisoning us today. When chlorine is added to your water, it joins with other compounds to form Trihalomethanes, or THMs. These chlorine byproducts, not only cause cell damage, but are highly carcinogenic. According to the US Council of Environmental Quality, people that consume chlorinated water have a 93% higher chance of cancer than those that do not. Breast cancer, which now affects one in every eight women in North America, has recently been linked to the accumulation of chlorine compounds in the breast tissue. 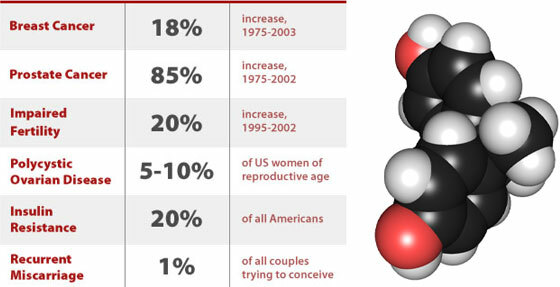 A study carried out in Hartford Connecticut, the first of it's kind in North America, found that, "women with breast cancer have 50% to 60% higher levels of organochlorines (chlorination byproducts) in their breast tissue than women without breast cancer"
Inhalation is a much more harmful means of exposure since chloroform the chlorine gas we inhale goes directly into our blood stream. Chlorine vapors are known to be a strong irritant to the sensitive tissue and bronchial passages inside our lungs. This is why it was used as a chemical weapon in World War II. The inhalation of chlorine is a suspected cause of asthma and bronchitis, predominantly in children. Chlorine also has a very negative cosmetic effect, robbing your skin and hair of moisture and flexibility, resulting in a less youthful appearance. Just swim in a chlorinated pool and feel the harsh effects that chlorine has on your skin and hair. Chlorine is a highly corrosive, greenish-yellow gas with a pungent odor that is derived from natural sources such as salt (sodium chloride) and produced in mass quantities for industrial use. It will react violently with organic substances. Chlorine is a building block for PVC plastics (vinyl) and for numerous chemicals, including pesticides, refrigerants, anti-knock compounds, and antifreeze. Dissolved in liquid to form sodium hypochlorite, or bleach, it is widely used as a disinfectant, in bleaching, and to purify public water supplies. Another form, hydrochloric acid, may be used in some toilet bowl cleaners. Household bleach is a weak sodium hypochlorite solution. Household bleach is the most common cleaner accidentally swallowed by children. Children can also be exposed to dangerous gases when cleaners containing bleach are mixed with other cleaning agents, such as ammonia. Concern about chlorine exposure also arises from its ability to form more toxic byproducts. Chlorine reacts with organic matter in drinking water to produce trihalomethanes, which may cause cancer and possibly developmental effects. A recent study links children’s exposure to one byproduct, nitrogen trichloride, in chlorinated indoor pools to asthma. Chlorine bleaching of paper and the manufacture and incineration of PVC plastic results in the formation of highly toxic dioxins and furans. an association between cancer and chlorinated water." The addition of chlorine to our drinking water began in the late 1800s and by 1904 was the standard in water treatment, and for the most part remains so today. We don't use chlorine because it's the safest or even the most effective means of disinfection, we use it because it is the cheapest. In spite of all our technological advances, we essentially still pour bleach in our water before we drink it. The long-term effects of chlorinated drinking water have just recently being recognized. According to the U.S. Council Of Environmental Quality, "Cancer risk among people drinking chlorinated water is 93% higher than among those whose water does not contain chlorine." 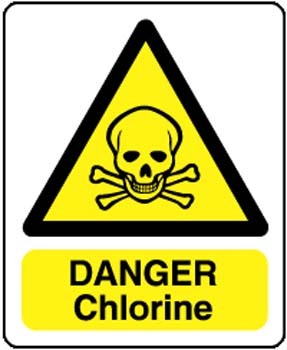 Simply stated chlorine is a pesticide, as defined by the U.S. EPA, whose sole purpose is to kill living organisms. When we consume water-containing chlorine, it kills some part of us, destroying cells and tissue inside our body. Dr. Robert Carlson, a highly respected University of Minnesota researcher who's work is sponsored by the Federal Environmental Protection Agency, sums it up by claiming, "the chlorine problem is similar to that of air pollution", and adds that "chlorine is the greatest crippler and killer of modern times!" Breast cancer, which now affects one in every eight women in North America, has recently been linked to the accumulation of chlorine compounds in the breast tissue. A study carried out in Hartford Connecticut, the first of it's kind in North America, found that, "women with breast cancer have 50% to 60% higher levels of organochlorines (chlorination byproducts) in their breast tissue than women without breast cancer." One of the most shocking components to all of these studies is that up to 2/3s of our harmful exposure to chlorine is due to inhalation of steam and skin absorption while showering. A warm shower opens up the pores of the skin and allows for accelerated absorption of chlorine and other chemicals in water. The steam we inhale while showering can contain up to 50 times the level of chemicals than tap water due to the fact that chlorine and most other contaminants vaporize much faster and at a lower temperature than water. Inhalation is a much more harmful means of exposure since the chlorine gas (chloroform) we inhale goes directly into our blood stream. When we drink contaminated water the toxins are partially filtered out by our kidneys and digestive system. Chlorine vapors are known to be a strong irritant to the sensitive tissue and bronchial passages inside our lungs; it was used as a chemical weapon in World War II. The inhalation of chlorine is a suspected cause of asthma and bronchitis, especially in children… which has increased 300% in the last two decades. "Showering is suspected as the primary cause of elevated levels of chloroform in nearly every home because of chlorine in the water." Dr Lance Wallace, U.S. Environmental Protection Agency. Water bottles stored in hot conditions can leach out chemicals that can lead to breast and other types of cancer. 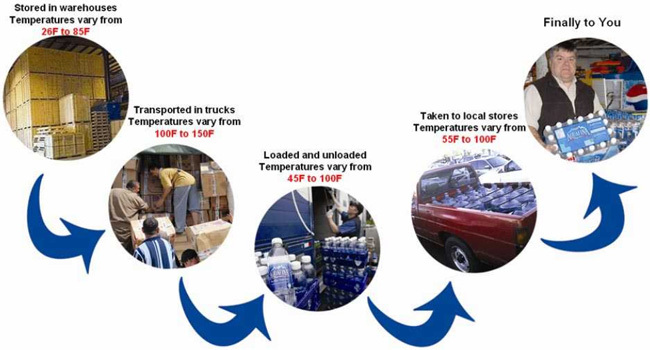 Bottled waters are subjected to extreme temperatures during their storage (warehouse) and transportation process. Health can be damaged by toxic chemicals like Bisphenol_A (BPA), leached from bottled water. BPA intake can also cause cancerous cell in body. (c) 2014Water Solutions. All rights reserved.